Sorry folks, the vegan cheese is no longer available, but we hear folks ask about it now and then. If you want it, let them know! The soups, however, are still fantastic! I had a superb bowl of tomato, fennel and orange this afternoon. The glowing review of this food cart is at my fingertips. I want you to visit this mini house-shaped business that warms my heart and feeds my stomach with its sincerity. There are two things that halt review from the get go, besides the obvious problems of you not being able to visit if you don’t happen to go downtown on weekdays, or if you’re one of those crazy people who fear food carts. 1) While a cup of soup is reasonably priced at $3.50, and a bowl for $5, leaving with a cup plus a basic vegan grilled cheeze had me willingly taking $8.50 plus tip out of my pocket. It was a wholesome meal that was worth it, which I’ll discuss soon, but spending above the $6 range on my lunch hour without leftovers isn’t financially responsible of me, no matter how much of a soup and grilled cheeze habit I want to enter into. 2) The split pea begged for more salt. I like salty food and left the cart without doing so, my bad. They do have salt and hot sauces available on the counter. With those notes out of the way, let me admit that it truly is going to be difficult not developing a soup and grilled cheeze habit this spring. With its infamous rainy season, Portland is obviously a city with eight months of soup appropriate weather. Check the bottom of this post for local vegan soup recommendations. This past January, a new cart brought more vegan soup to the downtown lunch crowd. 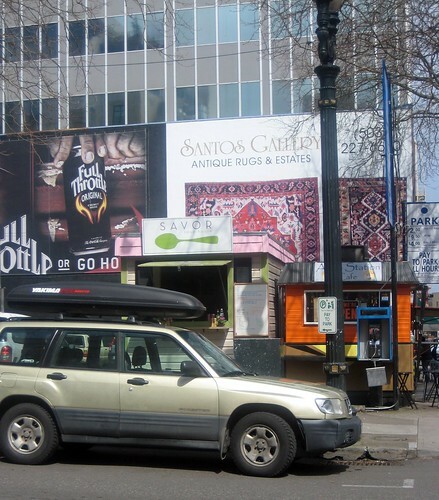 Run by chef Nancy Ettinger of Savor Portland, Savor Soup House is a pastel, picturesque cart with a light pink roof and a big spoon on its sign on the corner of SW 10th and Alder, just above the cart mania on 9th. The cart prides itself on being local, seasonal, and sustainable – three things Portlanders love to hear and eat. A loyalty card encourages you to bring your own container ten times and receive a cup of free soup. There are no tables provided, but O’Bryant Park is around the corner with plenty of wall to perch on. There seems to be at least one vegan soup per day, if not two, although sometimes you will need to request a non-vegan addition on the top to be left off. This is the case with a recent French Onion Soup, which is labeled as vegan, specifically minus the goat cheese toasts. Typically, you get two slices of Grand Central bread with your serving. 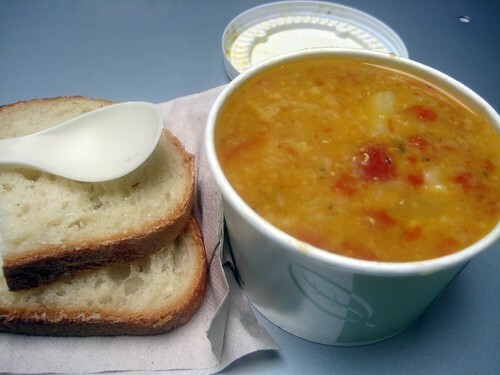 Vegan soup choices have included Tomato with Fennel and Orange, Hungarian Mushroom with Fresh Dill, Curried Cauliflower and Red Lentil, Indian Spiced Lentil, and Smoky Split Pea. They also serve stews for a bit more per bowl, but they’ve yet to include a vegan option. This Stumptown Vegan has tried two soups so far. The Curried Cauliflower and Red Lentil was a visually appealing golden cup of the pulses with spots of cauliflower and colorful chunks of red tomato. At first spoonful, the soup was seemed a tad bland. By sips two and three, I realized there was a buildup in the mingling of subtle spices. By what could have been spoonfuls thirteen and fourteen of this semi-thick cup of lentils, I realized I was not going to have leftovers. It’s a wonderful, memorable variation of a classic soup. The Smoky Split Pea was listed as flavored with fresh herbs, inluding thyme and rosemary, and smoked paprika. As I mentioned earlier, it just seemed to be missing something. Don’t get me wrong, it’s a soup I would order again, but I would reach for something to enrich this otherwise delicious earthy, green, and creamy porridge. Surely these soups are made in big batches, and hopefully the next cup of split pea will fulfill the saltier and smokier potential. A cup with the side of bread is a satisfying amount of food for lunch, but if you have a big appetite opt for the bowl. 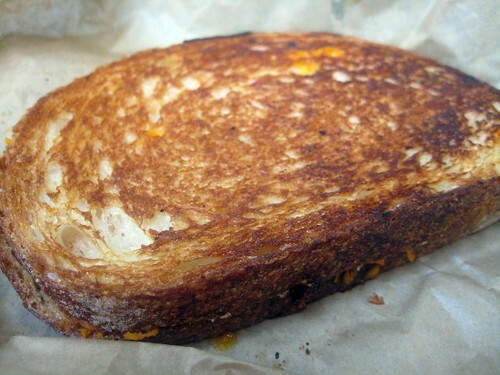 If you’re even hungrier and looking for more vegan comfort food, please try the vegan grilled cheeze. Savor Soup House has a gourmet grilled cheese menu with additions of Dijon mustard and caramelized onions, and they have added Follow Your Heart Vegan Gourmet cheddar to the menu for us vegans. At a base price of $5, it’s a well-melted, sunny orange filled sandwich on perfectly grilled, sliced como bread that is cooked pressed-style on a griddle right in the cart. If you like this brand of packaged vegan cheeze or are curious to try it, support this cart’s vegan grilled cheeze effort and stop by. 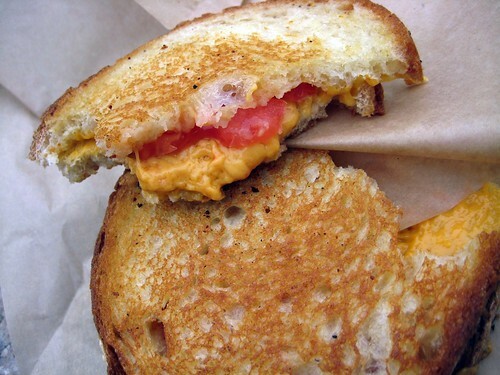 Besides the beloved Bye & Bye, the only other place I can think of in town to get a classic grilled vegan cheeze is your kitchen, but correct me if I’m wrong! If I didn’t dislike fennel so much, I’d be all over a cup of their Tomato Soup and a Grilled Cheeze, and simply in denial about the price and brown bagging it the rest of the week- because it is totally worth it. You can follow the cart on twitter here. It’s an active feed with updates on the daily soups. Looking for more great vegan soup options in Portland? Check out No Fish! Go Fish! (which also has a cart downtown), Sweetpea Bakery(rotates seitan stew! ), Red & Black Cafe, Papa G’s Deli, and Blue Moose to name a few. I’m not sure if they still do but I believe the Tube use to have vegan grilled cheese sandwiches. Thanks for posting this review Jess! I walked past here the other day and wondered about vegan options. Sadly, I am a foodcart fearer, but I must work on that! your cart reviews always make me sad that i work in beaverton! if i get a free weekday, i’ll have to try this place. don’t feel too bad for me though, as i live 3 blocks from the hawthorne cart pod. Their grilled cheese might have competition. 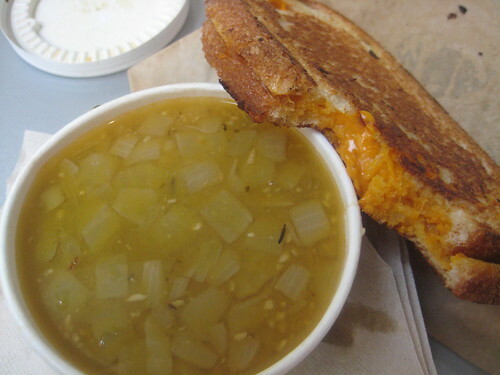 The Grilled Cheese Grill opens tonight on 11th and Alberta–they have vegan cheese for an extra 0.75 cents. Nancy told me (a month ago?) that the caramelized onions are not vegan. You didn’t necessarily say they are, but you did mention them. Are they vegan now? Thanks so much for the lovely post. Just wanted to comment that we do actually have a vegan stew on Wednesdays. It’s a red lentil & chickpea stew with butternut squash & saffron topped with peanuts and cilantro. We’re now offering a vegan spinach salad as well with molasses-glazed pecans, oranges and sliced red onions with a sweet lemon-garlic vinaigrette. Yummm. Hope to see you all soon!